Art and religion are knitted together in a manner that it becomes impossible to separate the two. Line and colour are tools that help to express the artists religious sentiments. The elephant headed deity is one of the most frequently encountered icons of the Hindu pantheon. Images of Ganesha are often installed over the entrance to almost any structure where people live or work. In a horizontal panel are three niches housing an equal number of important deities. The middle niche has Ganesha seated in a lotus position. As in most images, while Ganesha's head is painted white, his body is pink, a shade of red believed to be the colour of the muladhara chakra, over which Ganesha presides. . 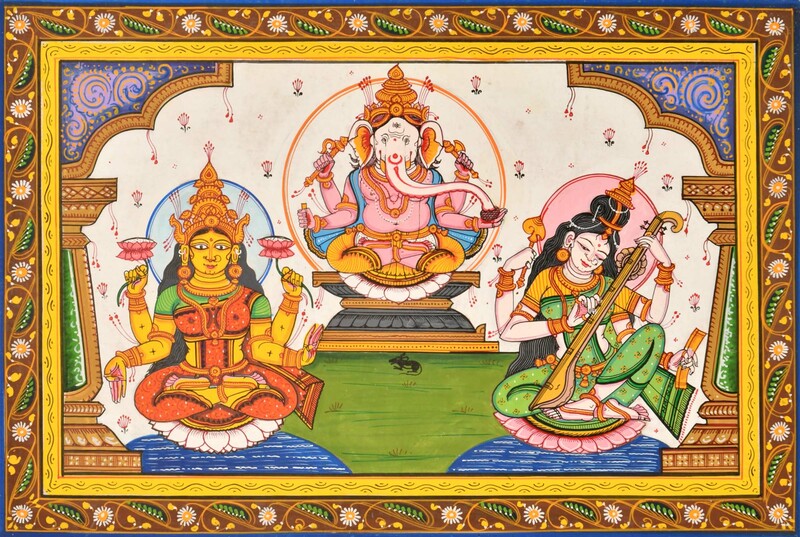 Images of Lakshmi, goddess of prosperity and Saraswati, goddess of learning flank that of Ganesha in order to amplify his various attributes. Lakshmi is seated on a inverted lotus pedestal. Though her iconography is today varied but the earliest images all show her seated on a lotus. In the back two hands, Lakshmi holds two lotus flowers on which are placed elephants with flywhisks held in their trunks. Saraswati's gleaming white body expresses well her purity and transcendence keeping in with her association with sattvaguna. .